The cross country and swimming teams hand their houses down — along with their stories. If walls could talk, 2147 Sherman Ave. would recount splits and swim races. For the past eight years, members of the varsity men’s swimming team have lived in this house. Although it is passed on to the next generation of swimmers each year, the house maintains its original flair. A giant TYR flag hangs in the kitchen above piles of unwashed dishes. A 2004-05 team meet schedule covers the cabinets on the second floor, as well as a poster of King John signing the Magna Carta that team members have passed down since the early ‘90s. One of the first tenants was Alec Hayden, now the assistant coach of women’s swimming at the University of Illinois. In 2007, boys occupied the top two floors while girls lived on the first floor. “I liked having our closest friends together and it was nice being able to hang out with them all the time,” Hayden says. Current landlord Ed Mar, who’s managed the house since the first year the team lived there, has noticed a change in the cleanliness of the house in recent years. Mar also leases two other properties to NU students, but he says the swimmers are the most responsible in managing their own affairs. “Neighbors are often cautious of having students live next to them, but the boys don’t have a lot of late-night parties and keep the noise down,” Mar says. Today, only males live in the house: eight swimmers, one non-athlete and Woodhouse the cat. Woodhouse joined the family last year when Weinberg junior Jordan Wilimovsky thought it would be fun to have a pet after seeing an ad for a free cat on Craigslist. The cat is now an active Facebook user under the name Woodhouse Meows. 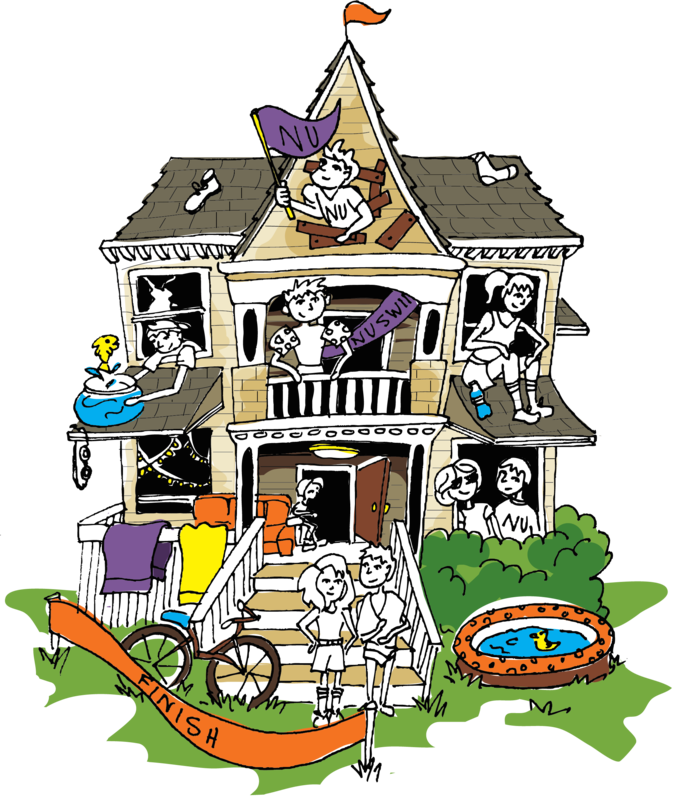 Northwestern swimmers past and present have the house ingrained into their memories, but the tradition is starting to slip away. This year the women’s swimming team lost its house lease after two years because not enough team members wanted to stay there. Men’s team captain Van Donkersgoed, a SESP junior, fears the same thing will happen to the boys’ house. Several streets down at 1023 Garnett Place, the women’s cross country team lives in a three-story house. The team moved there three years ago and it has remained part of the team’s ever since. Medill sophomore Ellen Schmitz lives on the first floor. Her bedroom walls are lined with race bibs from her years of running. But there is more to the house than cross country memorabilia. Now part of team tradition, a strip of wallpaper covered with images of butlers wraps around the kitchen. The girls also hope to find a house-wide television show to watch together. Full disclosure: Danielle Elliot is on the women’s swimming team. Ellen Schmitz is an NBN contributor.